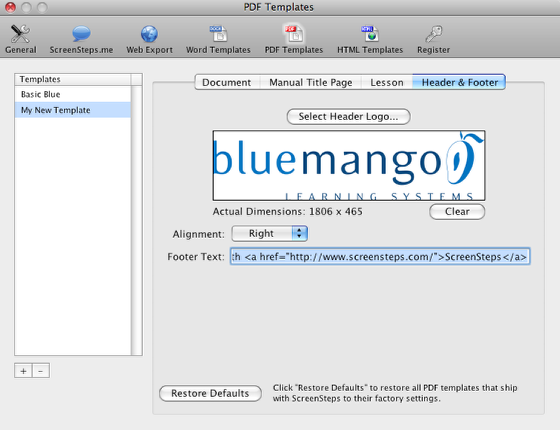 ScreenSteps allows you to customize PDF output using PDF templates. 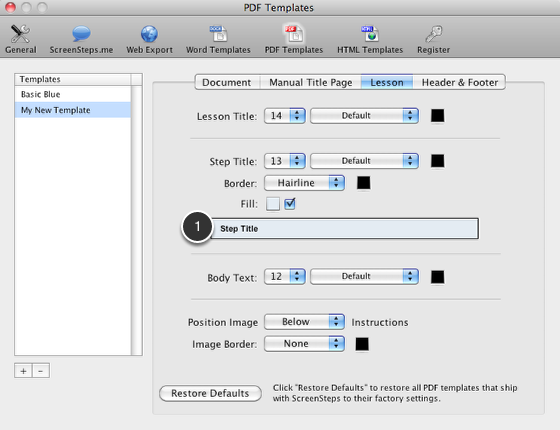 A PDF template controls how your individual lessons or manuals look when you export to PDF. Click on the PDF Templates icon in the toolbar (1). Now click on the + button (2) to create a new template. A new entry will appear in the Templates list (3). At this point you can enter a name for your template. Use the Document tab to change page size, orientation, font and other document specific settings. 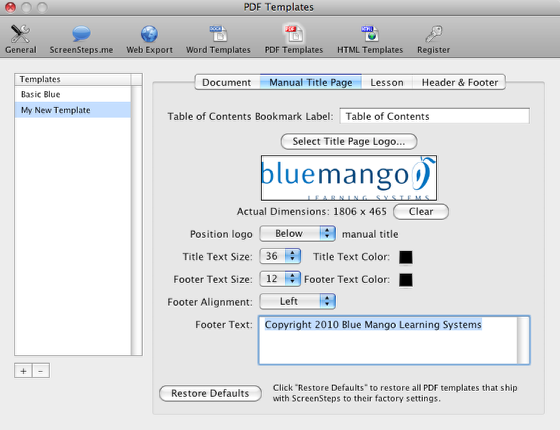 If you are using ScreenSteps Pro you can customize the title page that appears at the front of each manual. On the Manual Title Page tab you can do things like add a company logo, add a footer and customize the text size and color. Note that if you want to have multiple paragraphs in the footer you must surround each paragraph with "<p>" tags. The Lesson tab allows you to customize the look and feel of your lessons. As you experiment with the step title settings the preview (1) will update. 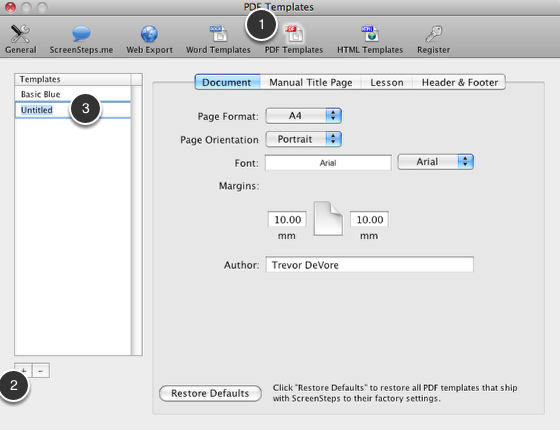 The Header & Footer allows you to customize the header and footer that will appear on each lesson page. In addition to selecting a logo for the header you can enter text that will appear in the bottom-right corner of the page. This screenshot demonstrates how you can use HTML markup to add hyperlinks in the footer. This example links to the screensteps.com home page. Does anyone know if it's possible to insert a linebreak into the title text (on Manual Title Page)? @magnus: There isn't a way to add line breaks to the manual title right now. Is it possible to add the date of the PDF generation to the footer? That would be great for ISO document control. Magnus, I have Adobe Acrobat Pro and I was able to create a PDF from a file where I had set up my manual title page in Word. I then combined my manual and my title page. You can delete the title page in the manual when you combine them. Worked perfectly. Does anyone know if it is possible to customize the table of contents page in a PDF export? I want to add a title/header, the text "Table of Contents", above the generated toc. @sean: not currently. You would need to either a) export to Word, make any changes in your word processing app and then export to PDF from there or b) use a program that can modify PDF files to add the text to the PDF file that ScreenSteps generates. @gorq: Are you on Windows? There are some issues with text input on Windows for some languages (I believe Czech is among them). The issue is that the characters are not being encoded properly when typed into ScreenSteps. We are trying to get this issue addressed but I don't have a timeline for when it will be fixed. Is there any way to change the Font from Times New Roman? Is there a way to customise the number of levels detailed in the Table of Contents. For some manuals I want to list the Steps within a lesson so that they can be found easily when the manual is being used as a reference guide. Is there any other way to further customize pdf outputs like potentially importing into adobe indesign, I would like to have alot more control. I want to use this to send out reports but need to be able to customize. @colin Not at this time. We will be including a much more robust PDF tempting system in the next major upgrade. Being able to import into Indesign is another option that is on our radar. Is there any other work arounds or examples of people putting together cool templates? Really want to use screensteps but need to be able to see that the end result can look really good. @colin The only workaround right now would be to create a custom Word template and export to Word. That offers the most flexibility for the time being. The current PDF template system doesn't allow you to get inside and change anything. @Adam - Once the new ScreenSteps 3 desktop client is released we will make an announcement about testing of the new product for non-ScreenSteps Live customers. The new product will have brand new custom PDF templates that are based on HTML/CSS. Aside from the more options that our template editor will provide you will also be able to create your own templates by hand. Hi Trevor, I think word templates are better since they give more control. Can I link word templates in screensteps live? (instead of the default pdf). 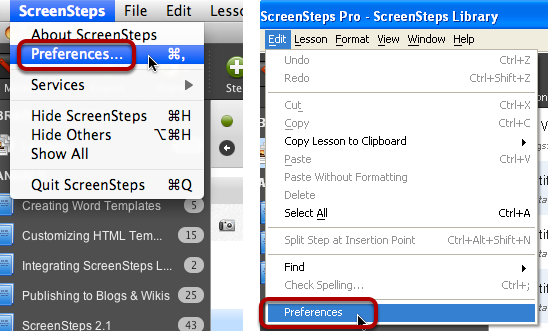 @Evan I you wanted to use Word templates you would need to manually attach them to the lesson using the ScreenSteps Live web administration area. The major upgrade to ScreenSteps/ScreenSteps Live that we are finishing up now has a new PDF template system, however. It is based on HTML and CSS. 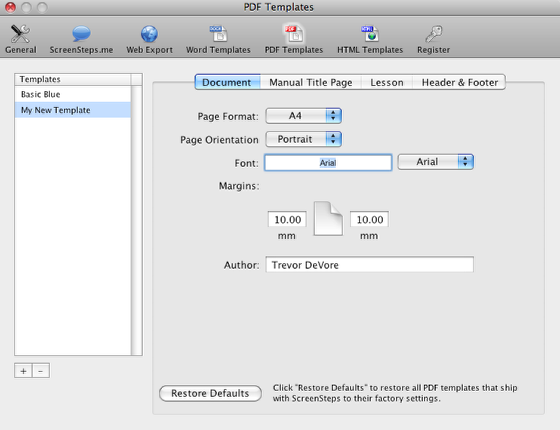 This means you (or a designer) can customize a PDF template to look just about any way you want. I am currently still using the pro version. We only use the export to pdf function. As we use the software so rarely, we don't want to upgrade to screen steps 3. Is there anyway to change the header image size in the old screen steps pro? @Alexander - No, there is not.